A recent report “Little Fish, Big Impact,”issued by the Lenfest Forage Fish Task Force calls for reductions in the harvest of herring sardines and menhaden. The report is the output from a panel of thirteen preeminent marine and fisheries scientists from around the world convened at the Institute for Ocean Conservation Science at Stony Brook University. The primary purpose of the Task Force was to provide practical, science-based advice for the management of species known as forage fish, because of their crucial role in marine ecosystems. The report details how the harvest of these important feeder fish has grown they now account for 37 percent, by weight, of all fish harvested worldwide, up from about 8 percent half a century ago. The consumer market for forage fish is relatively small; most of the fish are ground and processed for use as animal feed and nutritional supplements and, increasingly, as feed for the aquaculture industry, which now produces about half of all the fish and shellfish that people eat. 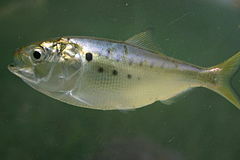 Menhaden are more commonly known as pogys and are frequently sited swimming in and around marinas. They breed and hatch offshore. Then the young migrate into brackish coastal waters to mature. Early in the settlement of Massachusetts Native Americans used them for fertilizer around corn plants. And in Colonial times they were regularly eaten and held in high regard for their taste. Boston fishermen will frequently capture them and use them as bait to catch larger fish such as striped bass and bluefish. For those who are sensitive to the pressure on this species, another way to help them (beyond reducing harvests) is to improve and increase habitats. And oyster reef makes a terrific habitat with lots of food and nooks and crannies to provide shelter. We have found pogys in and among our oysters several times. Perhaps it is time to look beyond what we take out of the pool and look as well at how we can increase the amount in the pool.